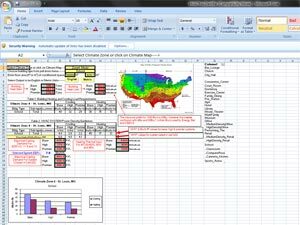 HVACPowDen 08a is a program for quickly estimating the required capacity and electrical demand of cooling and heating equipment for 30 different building types in the 10 US climate zones. Results are expressed in cooling tons, Btu/hr-ft2, total kW demand, and W/ft2. Program is now integrated with HVACSysEff.xls. Developed as part of an EPA-sponsored Energy Star Buildings project. Modern HVAC systems are increasingly complex and methods for comparing the SYSTEM cooling efficiency of various alternatives are not well established. This program is a method for 1) summing the power requirements of all system components, 2) deducting cooling capacity for the heat input of interior auxiliary eqipment, and 3) computing the net SYSTEM efficiency using three common units of measure: kW/ton, energy efficiency ratio (EER ≡ Btu/watt-hour), and Coefficient of Performance (COP ≡ WattThermal /WattElect). The SYSTEM efficiency for a variety of HVAC types are computed in the worksheets in this program. Results are shown below. Typical default values for each component are used and they can be corrected in the corresponding worksheets. Each system may include as few as three but as many as seven of the components listed below. A technical discssion of this method for computing SYSTEM efficiency can be found in the ASHRAE publications HVAC Simplified (2006) or the ASHRAE Journal (July, 2003).